The purpose of mold remediation is to remove the mold to prevent human exposure and damage to building materials and furnishings. 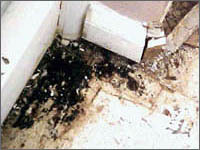 It is necessary to clean up mold contamination, not just kill the mold. Dead mold is still allergenic, and some dead molds are potentially toxic. In most cases, it is not possible or desirable to sterilize an area; a background level of mold spores will remain in the air (roughly equivalent to or lower than the level in outside air). These spores will not grow if the moisture problem in the building has been resolved. Areas involving more than 10 square feet of mold contamination are remediated within a containment area. The containment area is maintained under negative pressure relative to surrounding areas with the use of a HEPA - filtered fan unit ducted to the outdoors. This is to ensure that contaminated air does not flow into adjacent areas. 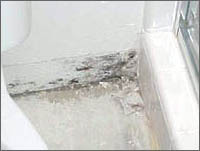 In some cases, indoor mold growth may not be obvious. It is possible that mold may be growing on hidden surfaces, such as the backside of drywall, wallpaper, or paneling, the top of ceiling tiles, the undersides of carpets and pads, etc. 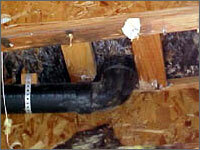 Possible locations of hidden mold can include walls or ceilings with leaking or condensing pipes, as shown to the left. Below are further examples. When we removed the kick plate to this bathroom vanity cabinet, mold was found growing underneath and behind. By knowing that the wall between the toilet and shower had been intruded by water and had been wet, the baseboard was removed revealing what we were looking for. Aspergillus niger, one of the most familiar molds, begins as a microscopic, airborne spore that germinates on contact with the moist surface of nonliving organic matter. 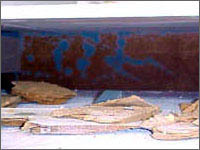 This picture shows the damaging effect at the base of a shower to the wall and subfloor.